This tutorial will teach you how to set up the ExpressVPN Router App on the Asus routers. IMPORTANT: The steps below only work for the Asus RT-AC68U, RT-AC87U, RT-AC56R, RT-AC56S, and RT-AC56U. 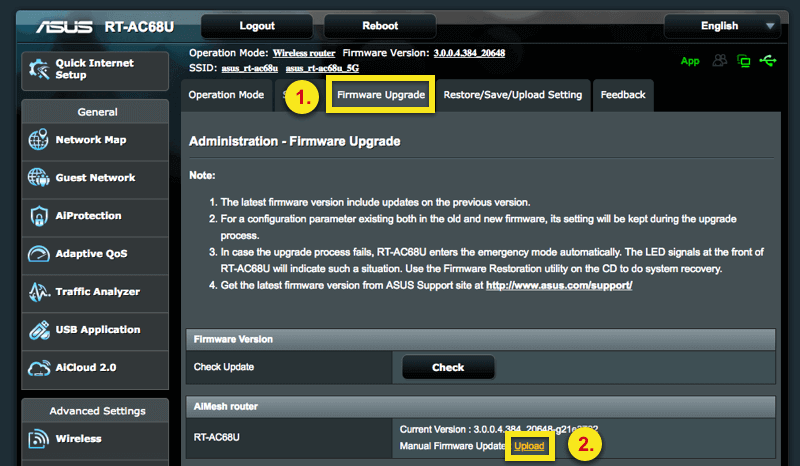 Make sure you are using the correct firmware for each model or the setup process will not work. For other router models, see the manual router setup instructions here. Click on Router on the left side of the screen. On the right, select your router model name to then click Download Firmware. You will also see your activation code listed on the screen. Keep this tab open or paste your code into a word processor, you’ll need to refer to it later. Need help? For any issues, please contact the ExpressVPN Support Team for immediate assistance. Note: ExpressVPN recommends keeping your existing network and adding the ExpressVPN router as a second router. If you would like to only use the ExpressVPN router, you are recommended to first set up the ExpressVPN router as a secondary router and later remove your primary router. Follow these setup steps if your router does not have internet access. Follow these setup steps if your router has internet access. the secure wireless network name found on the bottom of the router. 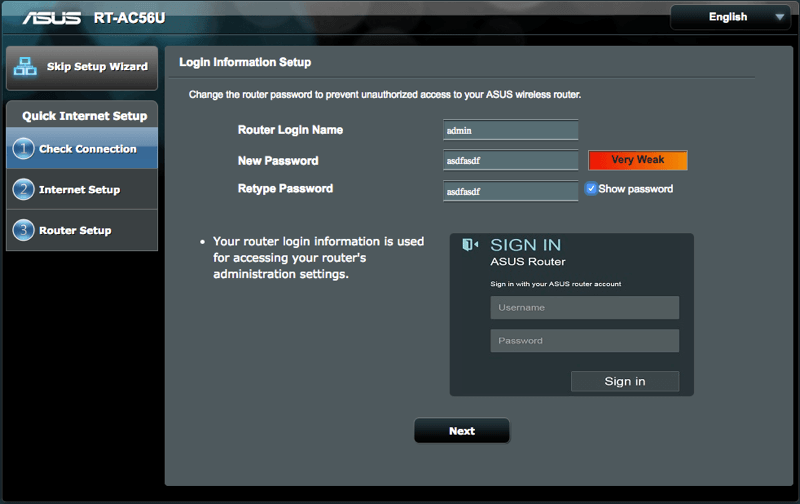 Access the Asus router dashboard. If you need help finding your router’s gateway, follow the instructions here. If you are logging in for the first time, enter ‘admin’ and a temporary password. Click Next. Select a password for the router’s SSIDs. 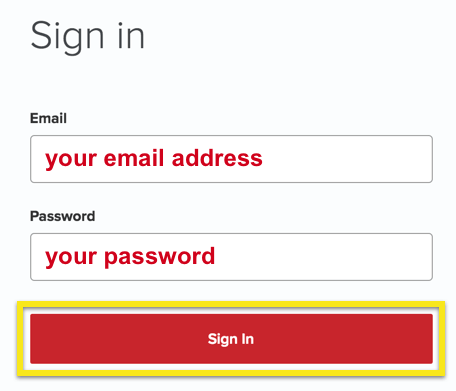 Input the password and then click on Apply and then Complete. You will now arrive at the router admin dashboard. Proceed to the steps below. You should be connected to the internet and able to browse sites on the internet. Open a browser and access the Asus router dashboard. If you cannot access the dashboard through the URL, try to find your router’s gateway (e.g. 192.168.1.1). You can follow the instructions here. You will be prompted to login. Enter your existing router username and password. On the left side of your dashboard, click on Administration. For instructions on how to upload the ExpressVPN firmware, click on the link appropriate to your Asus firmware version number. Select Firmware Upgrade. 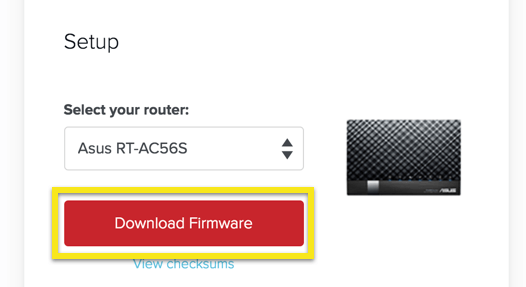 Click on Upload and select the firmware you downloaded previously. Note: if you see a message saying firmware file is invalid, please check you have the correct firmware. The firmware file name should also match your router model name. Select Firmware Upgrade. 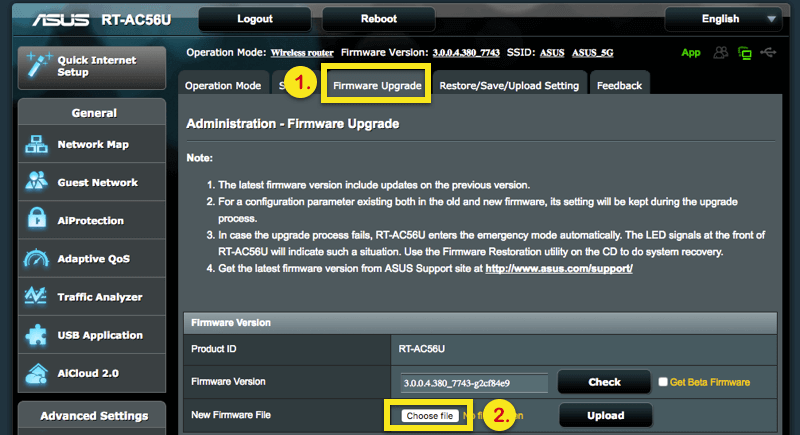 Click on Choose file and select the firmware you downloaded previously. When you see the message Router update is completed, you may need to reconnect your Ethernet cable to the router’s Wi-Fi. The Wi-Fi name is ASUS_(modelname)_(revision) or (for some hardware: Broadcom_Northstar) and the password is the PIN number printed on the sticker on the back or bottom of the router. Go to expressvpnrouter.com and log in with admin and admin. Enter the activation code you found above and click Activate. All devices connected to the Internet via your ExpressVPN router (either through cable or Wi-Fi) will have its traffic tunneled through a secure VPN. To connect any device to the VPN, plug its network cable into the ExpressVPN router or connect the device to the ExpressVPN router’s Wi-Fi. 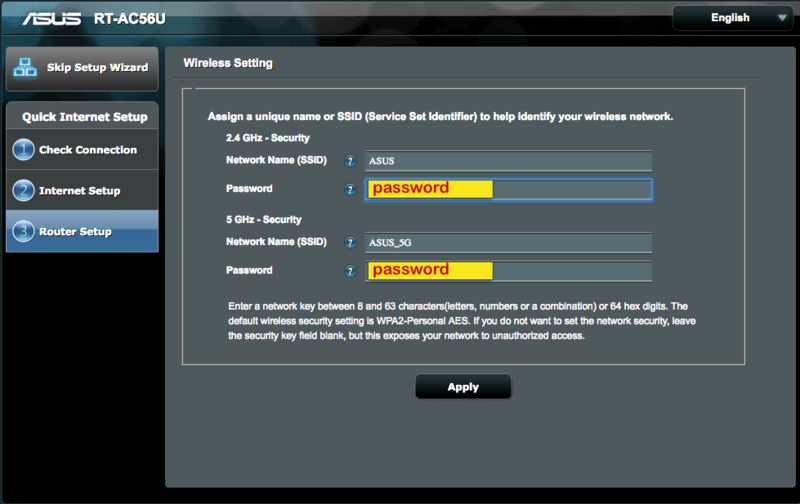 The network name and password are given at the back or bottom of your router. 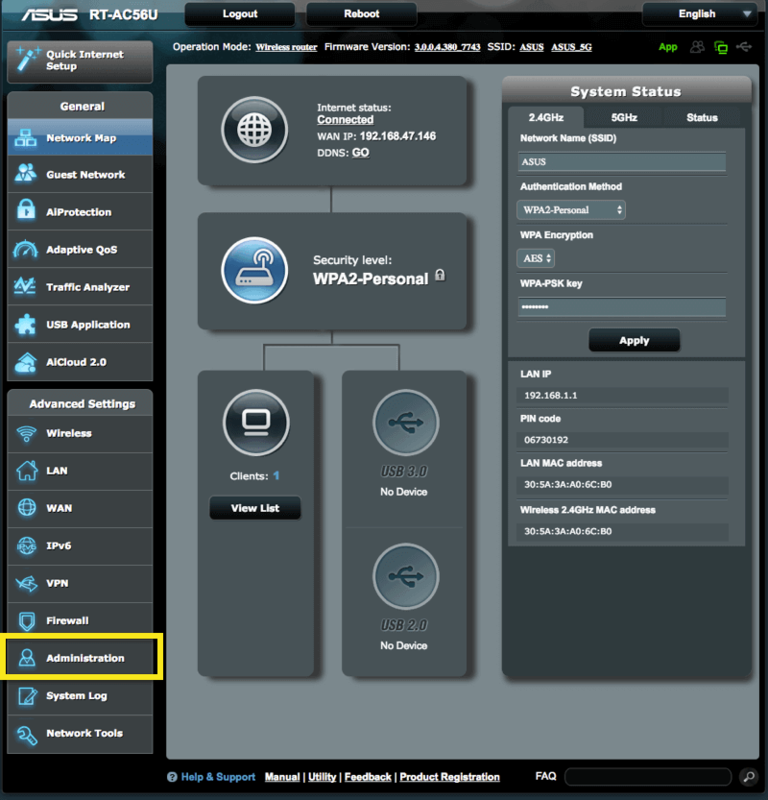 You can also change the VPN server location you are connected to or disconnect a device connected to the router by logging into www.expressvpnrouter.com. To connect to a different server location, make sure you are disconnected from the VPN. 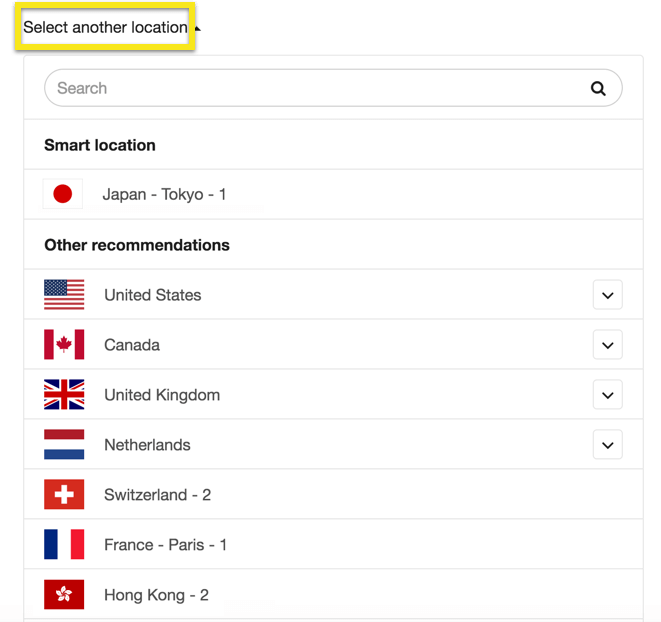 Click on Select another location, then click on the location you want to connect to. You can also use the search bar to search for a location to connect to. On the VPN tab, go to VPN Options. Scroll to Recently connected devices and select which devices you wish to have protected with VPN or not protected by VPN. Note: You will not be able to toggle VPN protection on/off for devices connected via a static IP.